JOIN US as we search for ways to spend MORE time planning vacations, and LESS time on the business side of things. and LESS time on the boring business side of things. 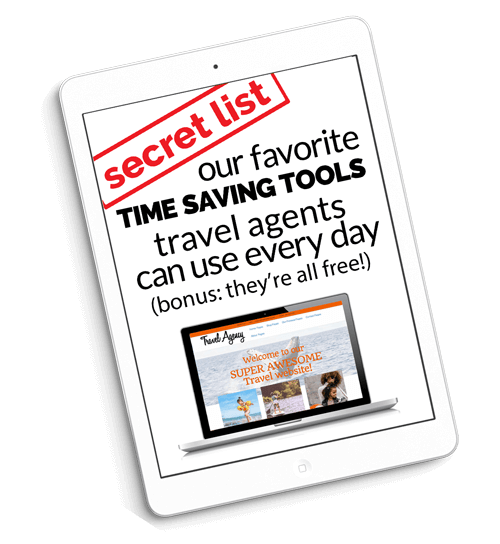 Do you LOVE planning vacations for your clients, but wish the business side of things was just a little bit easier? I saw a movie years ago called Bed of Roses. (Christian Slater was the lead actor if that tells you how long ago it was.) He played a wealthy man who lost his wife and child, and when telling his story, and explaining why he started delivering flowers, he said "I saw this guy delivering flowers and I though, it has to be the best job in the world, right? Everyone's always happy to see you." You could say the same thing about the travel industry. We have the best job! No one's ever mad about going on a vacation. And it would be perfect if we could spend our days planning surprises for our travelers, finding the perfect hotel, and learning about new experiences we can offer. But the other stuff, UGH! taxes, marketing, tracking payments... Those are NOT the fun things, but they're the things that seem to take up more and more of our working day. We're growing a community of travel agents who want to learn how to work smarter, so they can enjoy more of the work, and we'd love it if you'd join us! We have a lot of ways to keep in touch, but the most reliable is still email. So if you want to be sure not to miss a single thing, sign up. It's free! When we come across articles that are full of inspiration, good ideas, and useful insights you can use in your business we share them here. Get to know other Travel Geniuses, share ideas, combine resources, and be the FIRST to know when we've got news or ideas to share with you. Want to know how to use a tool we've shared? This is where you'll find that. Sign up for notifications to be alerted every time we release a new one. This is our weekly dose of ideas and inspiration. We're talking about what's working, what's new, and what's saving us time and hassle! Have an idea? Something you're struggling with? We have a LOT of exciting ideas, but we're always looking for more! Is there something you'd like us to cover? A great time-saving tip or tool to share? Something you're struggling with that you'd like us to look for a solution to? Let us know! Maybe we'll create some content around your idea. Thanks for sharing your suggestion! We'll be in touch if we have any follow up questions.